I’ll admit that I am a biased party when it comes to this amazing Michigan restaurant. I worked for Pacific Rim for nearly three years in University and after. When I had my first job in PR, I kept on working there two nights a week for extra money. They treat their employees with respect, I made good money and I made fantastic friends there. This time round was the first time I really felt like I didn’t work there anymore. The recently opened a gorgeous expansion, had quite a few new starters, and even hired some new people. I think the latter was more of a shock considering the turnover rate for that place is, like, three years at the minimum. I dined there twice, as one should when visiting Ann Arbor. The first night I tried some newer dishes (or at least new to me): the spiced quail for a starter and the short rib bibimbap for my main. I always have a hard time describing quail for those who haven’t had it. (‘Sorta like chicken, but better?’). The bird was lightly breaded and fried – a succulent little morsel perfect for wetting the appetite, but not spoiling it. It left me wanting more. 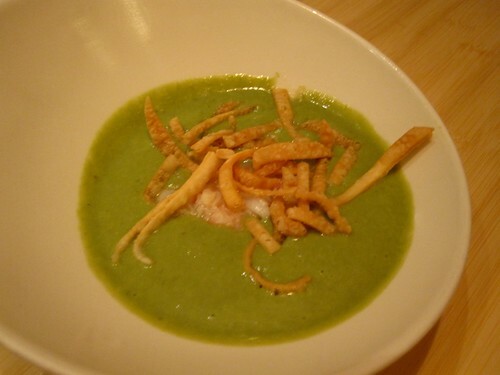 Then comes the soup: chilled avocado with crab. They always feature this soup in the summer. It is light and refreshing, despite being made pretty much of pureed avocado. It’s made with a tiny bit of jalpeno oil which gives it a slight kick. Lumb crab and crispy wontons garnish the dish. For the main, here’s some background. The restaurant used to be open for lunch where they served a more low-key menu that included many more Korean dishes, including the best dol sat bi bim bop I’ve ever had in my life. You would always be able to hear the rice suzzling on the hot stone bowl as it came out of the kitchen before it hit your table. 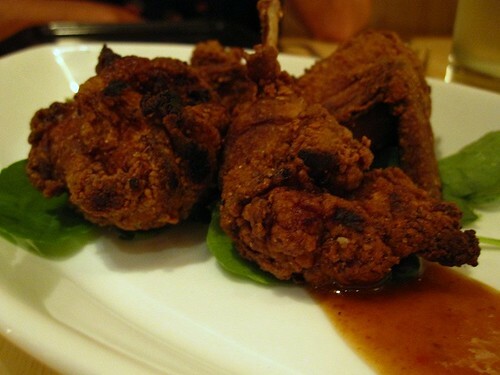 The ingredients were prepared fresh including the gochuchang. Mixing the veggies, marinated beef, the egg, the spicy sauce and the extra crispy rice was like heaven. 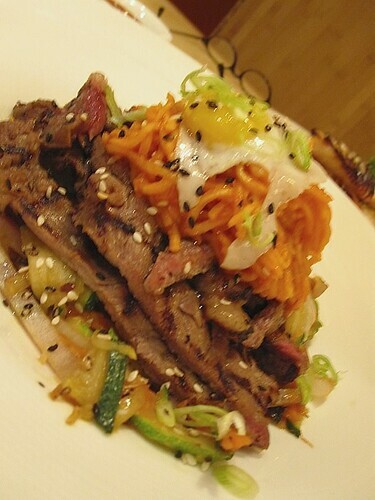 Basically it’s a plain bi bim bop with fancy ingredients. Lovely shortribs and all, I still miss my hot stone bowl. 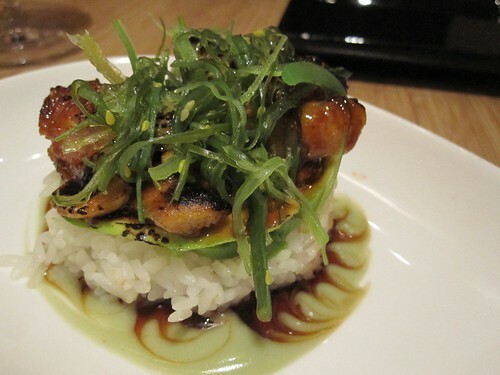 Unagi Terrine: Smoked BBQ eel served over avocado and sushi rice with a sweet soy glaze and wakami seaweed. If you love an eel and avocado roll, you’ll love this. ‘Nough said. 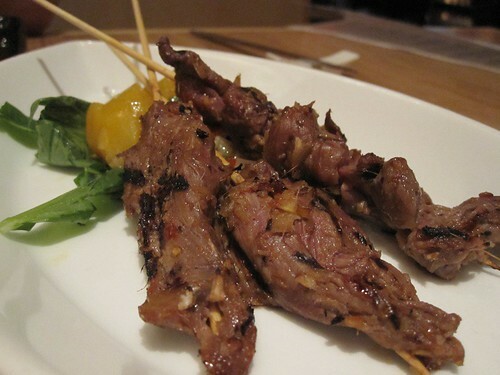 Lemongrass beef: Beef skewers marinated in a spicy lemongrass served with greens and mango. This dish is a take on a salad that used to be on the menu. The beef is zesty, but the mango balances it out. Yum. 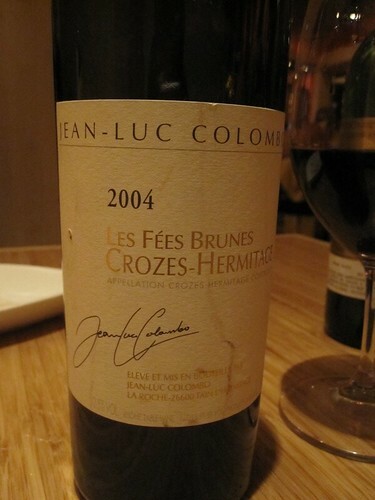 My friend brought with him two wines that would dictate our mains. 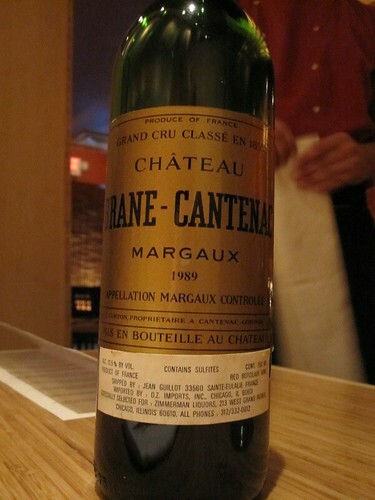 Both were robust reds, both called for red meat: 1989 Brane-Cantenac Margaux Grand Cru Classe and the 2004 Jean-Luc Colombo Syrah. 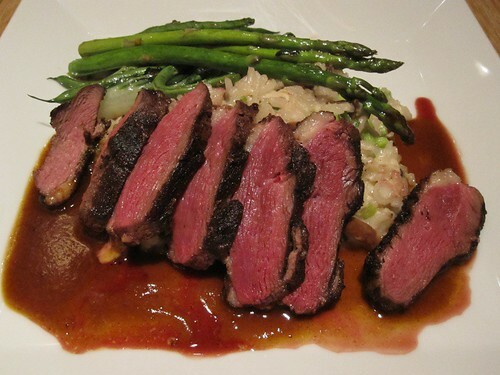 I went with the 5-spice duck: Duck breast marinated in grilled and topped with a Chinese 5 Spice sauce, served over duck confit risotto with bok choi, asparagus and snap peas. 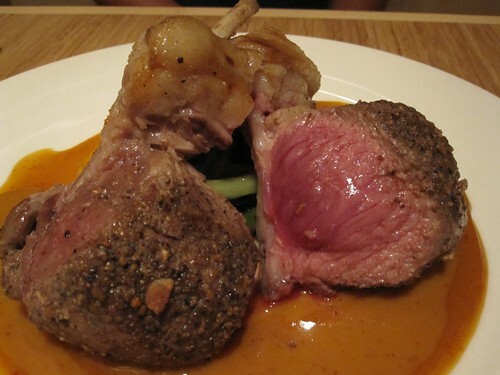 My friend went with the rack of lamb: Lamb grilled and served over a spicy peanut suace with sweet potato gratin, bok choi and asparagus. Sad to say, but both of these wines completely overpowered my duck. It’s not that the duck wasn’t perfect (it’s one of my favourite dishes! ), but it just wasn’t spicy enough to handle these ‘grow hair on your chest’ reds. The normally-rich clove, pepper and anise flavours got lost in the mix. The lamb, on the other hand, was the perfect choice, and I found myself stealing probably too many bites of my friend’s entrée. Both meats were served rare/medium-rare to perfection. Portions are on the large side, but that didn’t stop me from finishing every last bite. 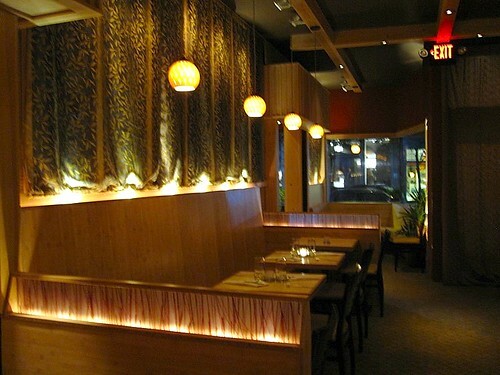 Pacific rim is honestly one of, if not, the best restaurant in Ann Arbor. But, like I said, I’m totally biased.